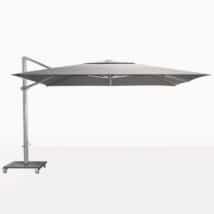 Embolden your outdoor area with an incredible Cantilever Umbrella. From the magnificent to Kingston to the versatile Mauritius, we have you covered with our high quality outdoor Cantilevers. At Teak Warehouse, we keep it simple. We use the best materials, the chicest designs and we ship to you! Our Cantilever Umbrellas sport a Sunbrella© canopy, available in classic taupe, canvas, black and grey and in square, round or rectangular shapes. 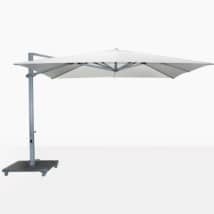 Sunbrella© is the leading outdoor fabric with its beautiful through dyed appearance, protection from ultra violet rays, and tough weave to make sure that it stays the test of time in your great outdoors! The framework is sturdy, sound powder coated aluminum which looks great and lasts long! 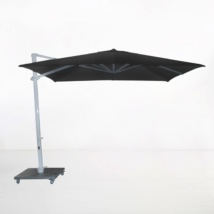 All Cantilevers are able to turn and tilt, giving you optimum protection from the sun! Imagine a large, open patio. You’ve set up your dining table and chairs, you’ve placed your relaxing deep seating set – now, you need coverage. 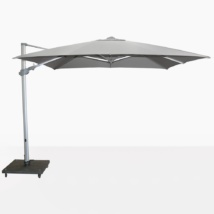 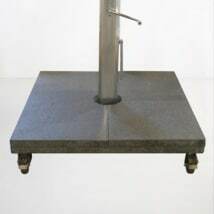 Our Kingston Cantilever is a massive 13 feet by 13 feet, it does a full 360 degree turn, so that you can lock the base in place and still have shade in a variety of areas! 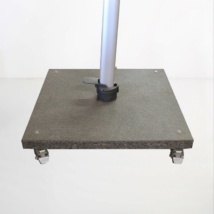 Like smooth edges and a softer look? Try the Antigua Round Cantilever over your beautiful Round Teak Pedestal Table for an elegant, pleasing dining area you will love. 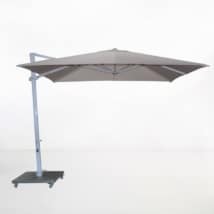 The Ascot Cantilever with its attractive rectangular shape looks incredible over a long dining table, pool or sectional deep seating. 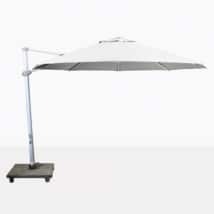 Teak Warehouse offers a wide array of sturdy Cantilever Umbrellas for your patio or outdoor space. 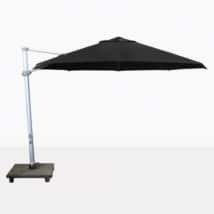 Our Cantilever Patio Umbrellas are the highest quality, made to last many years in all types of weather conditions. Our Cantilever Shade Umbrellas are built with premium materials like Sunbrella® fabric, stainless steel and aluminum. Call us today to discuss which Cantilever Outdoor Umbrella will work best for you!